Long overdue biography of an important America poet. 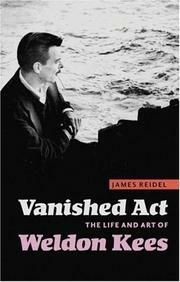 As independent scholar Reidel notes, Weldon Kees (1914–55) has been largely ignored by academia, although the “dark beauty” of his often nihilistic verse has in recent years won him minor cult status. He wasn’t exactly neglected in his day, publishing more than 40 short stories in the best mid–20th-century literary journals. Yet Kees never achieved the celebrity of other members of his generation, such as Robert Lowell and Elizabeth Bishop. He was ambivalent, expressing a desire to attain critical success as a writer without the attendant burden of fame. To that end, he arrived in New York in 1942, avoiding the draft, most likely, due to “defects above the neck.” Unfortunate timing, Reidel suggests, may also have played a role in keeping Kees in the minor leagues. His “light novel about campus life in the Middle West,” as an editor at Knopf put it, happened to cross the editor’s desk the day after Pearl Harbor. Following its rejection, Kees concentrated his creative writing almost exclusively on poetry. An accomplished polymath, in the last decade of his life he also worked as a book reviewer and cultural critic, a jazz musician and songwriter, an abstract expressionist painter, photographer, and experimental filmmaker. Yet the level of success he longed for eluded him in all these endeavors, and he died, a presumed suicide, at the age of 41. Subsequently, he was almost universally excluded from the academic literary canon, and his work seemed destined for what Nabokov termed the “Lethean Library” of obscurity. But enthusiastic champions like his biographer have determined to alter that river’s course. Reidel has also edited Kees’s as-yet-unpublished satirical novel, Fall Quarter, and is the editor of a Kees Web site.